St. Elias Ukrainian Orthodox Church is an excellent example of a modest church building that Ukrainian pioneers erected in Manitoba. Constructed under the direction of Dmytro Waskul beginning in 1908, this log church is distinguished by its small rectangular plan with curved ends that accommodated the vestibule at one end and the sanctuary at the other. The church can hold only about 30 standing adults. The interior was constructed in 1910 by Wasyl Cheredaryk and is a marvel of decorative design. The simple plank walls are carefully painted white and blue and a wealth of religious pictures and articles delight the eye. The iconostasis, the screen that separates the nave from the sanctuary, is a powerful composition made up of dozens of small icon paintings. 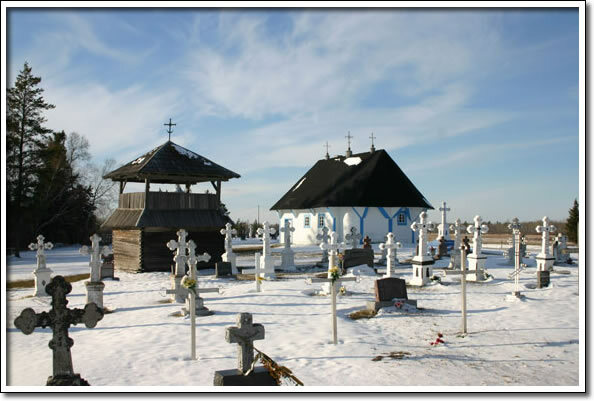 The site of St. Elias also contains a cemetery dotted with the distinctive tall white crosses of the Orthodox faith and a log bell tower of traditional design and construction. A new church and bell tower were constructed nearby in 1950.